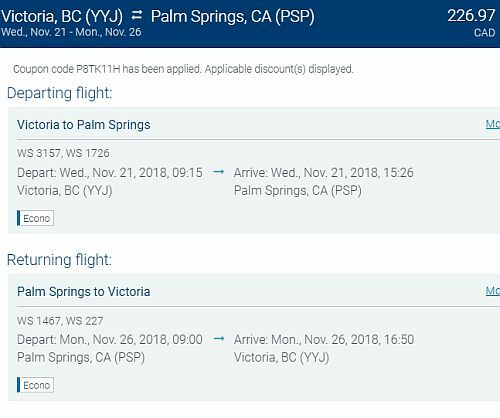 WestJet has dropped the price of their November and December flights from Victoria to Palm Springs, California down to $227 CAD roundtrip including taxes. The flights have 1 stop each way, in Calgary or Vancouver. - Look for the dates that are $257 roundtrip. NOTE: For 2019 dates, the promo code is not valid. 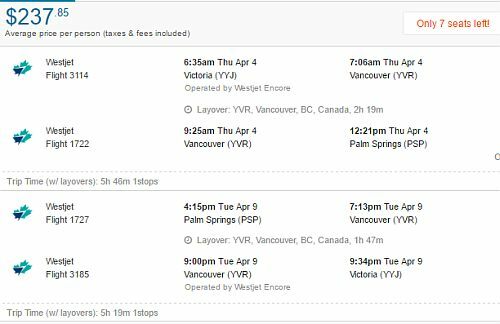 But if you go to Flighthub and try the same dates you found on Google Flights, you can find these flights for $237 CAD roundtrip. flight deals, california, westjet, united states, victoria, yyj, north america, palm springs and psp.